The Irish Museum of Modern Art (IMMA) has secured a significant five year loan of 50 works by one of the greatest realist painters of the 20th century. 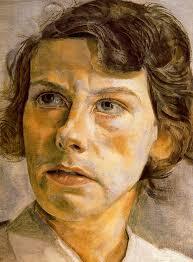 Lucian Freud (1922 – 2011). Renowned for his portrayal of the human form. Freud is best known for his intimate, honest, often visceral portraits. IMMA Collection: Freud Project Features a selection of 30 of the artist’s finest paintings, and 20 works on paper. The works, mainly dating from 1970 onwards, explore several of the artist’s key themes such as Portraiture: Self Portraiture: Still-life: Animals and Nature: works that reflect his interest in people and the natural world. During this unique five-year project IMMA will present a series of different and exclusive Freud related exhibitions, each year. The works, on loan to the IMMA Collection from Private Collections, are presented in a dedicated Freud Centre in IMMA’s Garden Galleries for five years, with all 50 works on display over the first 12 months. During this unique five-year project IMMA will present a series of different and exclusive Lucian Freud related exhibitions, with a new programme of events and openings each year. In this first year all 50 works are on display, while subsequent exhibitions will include works and new commissions by other contemporary artists in response to Freud, revealing exciting new perspectives on his work for artists and audiences today. With this extraordinary resource IMMA will become a leading International centre for Freud research with programmes, education partnerships, symposia and research that will maximise this important opportunity for schools, third level students, artists and audiences all over Ireland and beyond. Renowned for his portrayal of the human form, Lucian Freud is best known for his intimate, honest, often visceral portraits. Working only from life Freud’s studio was intensely private and he mainly worked with those he was close to, often asking subjects to sit for hundreds of hours over multiple sittings to better capture the essence of their personality. The works in the exhibition, mainly dating from 1970 onwards, explore several of the artist’s key themes – works that reflect his interest in the people and the natural world. Among those represented are members of his family; his children, grandchildren, his mother Lucie, other artists and friends and connections in the racing and business world. 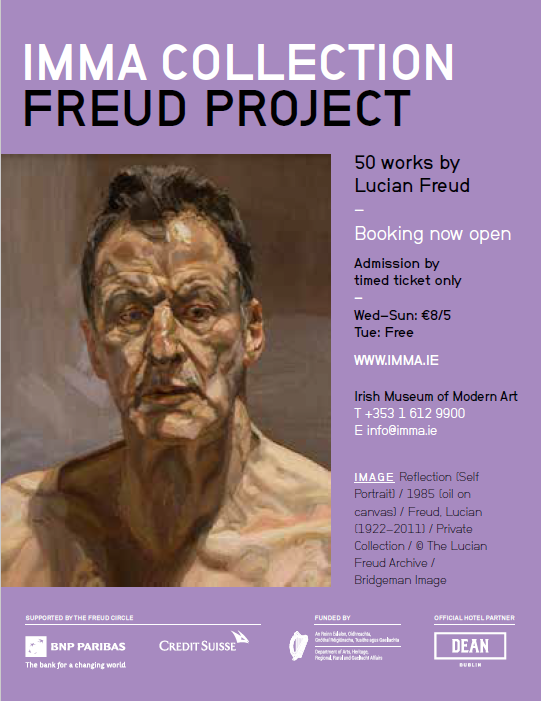 The IMMA Collection Freud Project looks at Lucian Freud’s role and legacy, not only in contemporary art and the history of figuration but also within specific themes around human existence, the self, aging, and the physical and psychological relationships between animals and humans. The project will explore his connections with Irish art developments from the early 1950s in particular both as a teacher at the Slade School, and as part of the Soho artistic milieu along with Francis Bacon, which drew Irish artists and writers including Patrick Swift, Edward McGuire, Brendan Behan, Patrick Kavanagh, Anthony Cronin and many others. Freud made several working visits to Dublin, where he found the rawness of the city of that time stimulating. This is the second major exhibition of Lucian Freud’s work shown at IMMA, in 2007 a major exhibition of his work resulted in one of the highest years for visitor attendance to IMMA to date. During the five-year period of the Freud Project there will be only one other International exhibition of his work; making Dublin the most comprehensive representation of the artist’s work in any museum worldwide until 2022. Admission for this exhibition is €8/5 (concession) with free admission for IMMA Members, full-time students and under 18’s. There will be free admission for all every Tuesday. Monies raised through admission charges will directly contribute to the care and development of the IMMA Collection. Due to the number and delicate nature of the works and the limited circulation space of the historic Garden Galleries, admission will be by timed entry. To avoid disappointment please pre-book your preferred time-slot online in advance of visiting. Online booking will be available from Saturday 15 October. This ambitious project has been made possible by the generosity of the lenders and the support of the Department for Arts, Heritage, Regional, Rural and Gaeltacht and is co-sponsored by the Freud Circle – BNP Paribas and Credit Suisse.